There are a lot of ways to loose control of your Facebook account. You may get hacked and ultimately loose Control over your facebook account. Certainly this is not the end of the world, but be aware that you can also be the victim of an attack by malicious softwares and hackers causing much more damage on your ​​Facebook account. 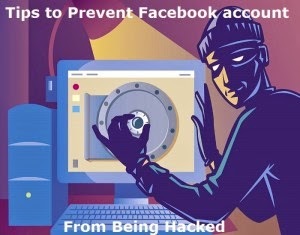 It is very important to Prevent Facebook Accounts from being Hacked. Indeed, while no software installed on your local system, there is nothing that your local antivirus can detect and your account may be hacked in one of hand trick, leading to all sorts of troubles. So today in this article we will discuss some Basic Tips to Prevent Facebook Accounts from Being Hacked. Whenever on Facebook you answer a quiz, install a Facebook game, or add any application , you will be forced to go through an intermediate screen showing what the permissions the application needs. These permissions can include almost anything, which may also include full access to your Facebook account, even when you’re not connected. In other words, if you do not carefully read the permissions required, you might end up giving more than just personal information, so beware next time and prevent your Facebook Account from being Hacked ! Also beware of videos on Facebook, Spammers are targeting Facebook to spread links of Spammy videos, Which on your click redirects you and takes control of your facebook account to Spam on other facebook comments, you might not be even aware that you have commented so and so thing on so and so place. Sometimes when you start a video, you receive a notification that you need to install or update a codec, which is necessary and essential to watch the clip. That may be true, but its often said that codec is actually a Trojan horse. For those who do not know, be aware that antivirus program is blocking it, although it could still slip through the net and suddenly be harmful for you. So be very smart when you come across this situation and prevent your Facebook Account from being Hacked. If you own Popular Facebook pages, then you may even receive Messages with names like - Facebook team, Security team, Facebook Security, etc. The Message would so legit that you will be forced to click on some link, Which are actually Cookie stealing apps and eventually you may end up loosing your facebook account so better ignore that message. No Facebook team will never send you such messages, so don't forget to Report that message. Facebook continues to work on security even within its platform, but the social giant can not help you to provide your personal information to play a game or a quiz . In addition, a local antivirus will not prevent this error. Add your phone number and change its privacy to Only me, So Even if there is any problem in your facebook account you may easily get it back by making facebook send you Code to your Mobile and Changing your Phone number Privacy to Only me will make sure that other people will not be able to see your Phone number. Add Security Question as a Secondary option to get back your Facebook account. Choose a Question, Answer to which only you know or add any other Unique answer which nobody knows but make sure you are able to remember it. Add People as Friends that you know personally, Many a times people on facebook adds many other people who they don't even know by their face. Facebook Asks you to identify Friends in which they are Tagged in. Turn on Notification when you log in to your facebook account, so whenever you login, you get a mail or SMS from facebook with information about time, date, Operating system and Browser. Change your Password Frequently, It is said that you must Use your Password as your Toothbrush. So keep changing it frequently to prevent your Account from being hacked. So these were some Basic Tips that Facebook users must consider in order to keep their facebook account secure and safe.